DisCARDbOARD - A week-long celebration of cardboard, first took place at the ForestCentre+ and Forest Cafe, in Edinburgh, between the 17th and 26th of January 2014. An exhibition of 35 local and international artists brought together everything from cardboard animation to furniture and art installation. 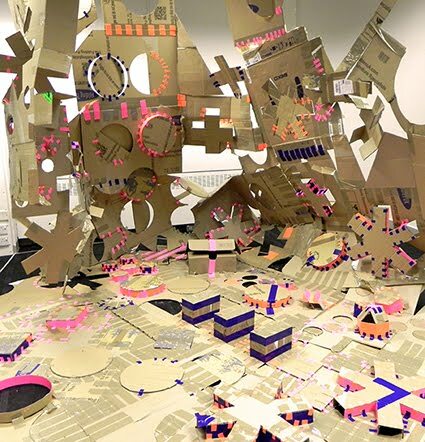 Along side the exhibition ran a series of workshops including build you own 2-D furniture, and a discussion night in which 3 artists gave us their answer to "why cardboard?". The week was ended with BOX WARS, a weapon and armour building workshop, followed by a fight until the death of cardboard. During this 'celebration', we were commissioned by Edinburgh International Science Festival to put on a mini-DisCARDbOARD as part of the, at Summerhall in April 2014.